Over the past couple of weeks I’ve written two installments on voice codecs (A Cornucopia of Codecs and Codecs Continued). I mentioned some of the major characteristics of six different codecs and why you might choose one over another. However, I failed to point out something that is of great importance when making your codec choice. What do you do about Dual Tone Multi-Frequency (DTMF) touch tones? This is not something you can ignore because compressed codecs such as G.729 and G.726 will not successfully pass those tones along from sender to receiver. Does that mean that those codecs aren’t compatible with your voice mail system and SIP phones? Absolutely not. Read on to learn why. How many of you are old enough to remember rotary telephones? For better or worse, I certainly am. In fact, it was all I knew for the first ten or so years of my life. Heck, we even had a party line for most of my childhood. Rotary phones used something called pulse dialing. You put a finger in the numbered hole in a “finger wheel,” pulled that wheel back to the “finger stop” and let go. During the return rotation, the electrical current of the telephone line would be interrupted in accordance to the number you dialed. The number one would interrupt 1 time and zero would interrupt the circuit ten times. The central office would then translate those current interruptions into the dialed telephone number. DTMF was introduced by AT&T back in 1963 as a way to replace pulse dialing and rotary telephones. Now, instead of interrupting the electrical current to dial a number, the telephone produced a tone to represent the dialed number. Actually, it was two tones blended together — thus the Dual Tone part of DTMF. DTMF has clearly been extended to purposes beyond simply dialing a telephone number. Interactive Voice Systems (IVR) prompt us for all sorts of things that we answer with button presses. We log into our voicemail systems and retrieve our messages with DTMF. If so inclined, you can even play Mary had a Little Lamb using DTMF. DTMF wasn’t a problem with digital and analog telephone systems because they both use a toll quality (64 kilobit, 8000 Hz) audio connection. The tones and speech easily mixed with one another and tone detection hardware was able to separate the DTMF out for applications that required it. However, with VoIP and bandwidth concerns came voice compression and different techniques to send a legible voice stream using as little bytes as possible. This compression and voice encoding techniques wreck havoc on DTMF and render the tones undecipherable by the components that need to detect and act upon them. Enter RFC 2833. With RFC 2833 you don’t send those DTMF signals on the same connection that you send your audio conversation. Instead, you send them out-of-band on their own stream. This allows you to compress the heck out of the voice without altering the DTMF signals. Note: Technically, RFC 2833 has been replaced by RFC 4733, but for the most part people still want to call it 2833, so I do, too. Depending upon the origin of the DTMF signals, they can start out in a separate stream, or that separate stream might be created by stripping the tones out of an audio conversation. An example of the latter would be a gateway that converts analog to SIP. Problems can arise from this stripping that need to be considered. The converter must “hear” the tone before stripping it out and sometimes there is leakage where the very beginning of the tone makes its way through. This might cause a voicemail system to “hear” two tones for a single tone. One would come from the RFC 2833 stream and the other in the voice stream. Fortunately, conversion hardware is getting better and better and these problems have become less common (albeit a bear to debug when they occur). So, in terms of SIP, how is this RFC 2833 stream created and managed? Through Session Description Protocol (SDP), of course. SDP is used to describe the voice stream (e.g. G.729) and it’s also used to inform the recipient that RFC 2833 is available. Specifically, it uses something called telephone-event. Here is an example of an SDP media description that you might see in the body of an Invite message. Note the format of “0 – 16.” This represents the ten digits plus *, #, A, B, D, E, and Flash. That’s probably about as much as you really need to understand about RFC 2833 and how it works. Its purpose is to create a separate stream for DTMF to allow voice codecs to strictly deal with creating the best possible voice stream using the fewest number of bytes. If you remember that you will be ahead of the game. Thanks! I do these in my spare time and I am happy to hear that they are making a difference. Is SIP INFO message used for DTMF ? That approach is frowned upon. There may be a few holdouts, but just about everyone has moved to RFC 2833/4733. You are correct and I fixed the text. Thanks for noticing it and commenting. When we are dialing the verizon conferencing bridge number and when dialing the passcode it is detecting two tones for a single tone. Please comment. It’s hard for me to know what is happening here. Are you using SIP trunks? It could be a problem on your end, inside the carrier, or inside the conference bridge itself. Great article Andrew, and praise to your effort in your blog – it has much to admire. I was wondering if youre recolection of a rotary phone is accurate? Doesn’t dialing zero invokes ten pulses? 🙂 Anyways keep up the great work! You are correct, David, and I fixed the article. I clearly wasn’t thinking when I typed that! Thank you for the explination. Very well written. Thanks for the great work Andrew ! I want to get clarified if this DTMF issue is related to the carrier or the PBX. When calling from cellphones on LTG/4G networks and reaches the IVR on the PBX, I can see from the wireshark traces that it uses HD Voice 16000khz, and what I learned from google is that it simply kills the dtmf tones, but if you call from 2G networks and landlines the dtmf works perfect and comes in 8000khz. So from my point of view, it looks like the SIP carrier just choose to use HD Voice on all calls that comes from their own network. The PBX uses RFC2833 and the carrier also uses RFC2833. But in my opionion it is the carrier that need to change the format ? Agree ? So, the tones are stripped, but it doesn’t send a 2833 stream containing the digits? If so, that’s not right. Could be a simple routing change to fix. I would love to solve. PCAPs could be relative if the event is not seen but heard is important. Does a routing change(s) make any difference, Likely it will. Can the caller hear the sound of the tone when they press the button? I would like to know the difference between rtpmap: 127 telephone-event and rtpmap: 101 telephone-event and which of the two is in band. Both are dynamic payload types and both are out-of-band. Are you seeing those types on the same system or different systems? I’m seeing in different systems, from a call from a SIP trunk to the PSTN. what happens is that I have a problem with calls that have rtpmap: 127 telephone-event not being completed and if you have rtpmp: 101-event telephone calls if completed. I could help me what would be the difference? If DtmfRelay is Enabled, Does it mean that RFC2833 is enforced ? As far as I know, they are not related. Hello Andrew I’m always confused when People say 2833 is OOB. Correct me if I’m wrong but the DTMF is technically in-band, but the DTMF payload is out of band? So the DTMF is audible but it is just using a different payload type that is outside of the dynamically negotiated UDP/RTP ports the rest of the audio uses. To me SIP info would be a true OOB protocol. I believe if you listen to the audio with a Wireshark you will just hear pauses because the DTMF is signaled between the two endpoints and not passed through the RTP stream like 2833. With 2833, the DTMF will be stripped out of the audio stream. It will only be represented by the separate RTP stream. Thank you very much for the article, I love it. I will definitely read even other SIP articles you wrote! I am trying to initiate DTMF Hook-Flash Relay on Patton Gateway 4112 with 2x FX-O. to enable thafeatrendt u a programed letter “E“ under the phones speed key. 14:50:54 TDM > [DSP 0xf7fd48] Dtmf playing stopped notify. 14:50:58 RTP > Termination  Dtmf to application ! 14:50:58 RTP > Termination  Dtmf update to application. 14:50:58 NTE > [00f65b00] Rx: Unregister notify. 14:51:02 RTP > Termination  Dtmf to application ! from 100ms to other value like 150ms (motofs PBXes) or 650ms (for Panasonic)? What if you see a=fmtp:101 0-15 and not a=fmtp:101 0-16. What would the 0-15 represent ? That was previously discussed in this article’s comments. AJ, a=fmtp:101 0-15 would represent DTMF digits 0-9, * # and A, B, C, D, in most pbx systems today the ABCD buttons are no longer used but still are accounted for in a numerical order since they are still used by other systems that may connect to the pbx such as two-way radios etc. Hope this helps. how to find out where dtmf (rfc2833) is lost in Cisco ASA 5510? Sip provider is sending them, Samsung officeserv 7200 is set to receive them, but they never arrive. im working with a Patton SN4971/1E24V in Florida, and i keep having the issue that callers from different providers when they hit the IVR no input is detected even if the caller actually press any option, keeping the call in an loop while the message replays. Right now im using Rfc2833 with codec G.711u – G.711a would it make sense to change to inband? Someone should do a SIP trace to see if the 2833 digits are coming through. Firstly an excellent read – very clear and informative! We have a voice network using SIP and TDM, however most of our customer base is SIP. I’ve come across a fault (might not be a fault) with one of our customers DTMF requirements. Basically we interconnect to them with SIP, they use a packet service profile which contains G711a and 2833 for DTMF relay whereas as on our side only G711a with default Inband for DTMF. During call set up I can see both offerings in their SDP profile, see below. This is to be expected as per negotiation. When the call establishes, and the customer send DTMF digits I can hear these in media traces, however it would appear that only the 1st digit is recognised by the far end and then all subsequent digits are ignored. I was advised that without 2833 enabled on our side all DTMF digits would be accepted via G711 inband, in other words rtpmap 101 would not be used and the method would fall back to inband. But that doesn’t appear to be case here. Would you be able to shed any light on this? It’s either behaving correctly because it isn’t possible to fall back or I have a fault on my hands. Look forward to our reply. Without 2833 the DTMF digits will be send as audio tones and if I am understanding you correctly, that is exactly what is occurring. 2833 would allow them to be sent as digital representations in a separate RTP stream. Thanks for the prompt reply Andrew. 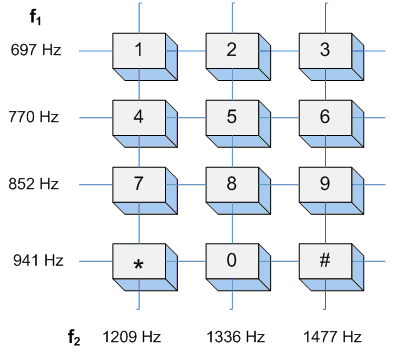 I understand that the digits would be transmitted as audio tones in the same RTP path as speech without 2833. My query is more to do with how DTMF is resolved during negotiation when one end point does not support 2833, as per the scenario above. If 2833 is not accepted nor advertised by the receiving end, then G.711 should be used. From what you wrote, it appears to be used, but the receiving end is not able to properly handle it. Thank you Andrew for this eye opener. Following up with your last response, what is the receiving end supposed to do if the 2833 is not advertised to it in the 183( SDP) response. Not use it. Send DTMF in the voice stream. From a call out i offer . Does that mean DTMF digits 0-9, * # and A, B, C, D are disabled and can’t be used in this call? Are all payload numbers (96-127) valid under RFC 2833 or they were only valid under RFC 4733? Carrier we connect to says when we send payload as 99 with telephone event for DTMF they do not support as they only support RFC2833. They say however that they support 97 and 100 as that is valid under RFC 2833.